Amazingly enough, this is actually my favorite book in the whole Goddess Test series thus far. The first one was all right, and the second one was extremely hot and cold for me, but this novella falls right in-between the first and second book, and we see a different side of Kate. This is the side that's still pining for Henry, but she has other things to keep her distracted, so her individual personality shines through more. I like Kate as a character, I always have, I just hate it when she turns into this whiny sniveling character that has nothing better to do than bemoan the fact that she'll never be as good as her sister, Persephone. 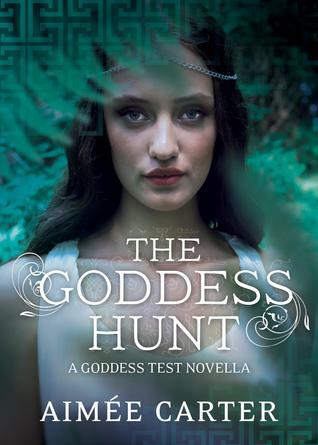 But in The Goddess Hunt, there isn't any trace of that annoying Kate, and all we see is a strong-willed woman who is coming into her own as a goddess--and a queen no less! She's learning how to use her judgment to deal with these situations where tough decisions must be made, and she doesn't mind stepping on people's toes to defend what she believes is right. She even goes so far as to defy Walter--Zeus--who is the king of the gods, and she does so without batting an eyelash. I absolutely loved this fiery and willful Kate, and, gosh, I want to see much more of her in the third book! Finally, we get to read from Henry's perspective, and it sheds some light on his feelings for Kate, and why he's woefully under equipped to actually show those feelings to her. It made me less angry at him for how he acted in the second book, because at least now I understand how he thinks slightly better. But still, it wasn't enough! I think Henry should have his own novella! That would be awesome! I loved Castor and Pullux's story, and them as characters. I think I'd like to see them again in the future, even if it's just a short cameo. I also very much enjoyed how other characters were expanded in this novella, such as Walter, who I frankly don't care much about. But it's interesting to see more from him, and his relationship dynamic with Henry is actually a pretty big thing in a subtle way, because they are like the two big kahunas in all of this--the two gods that are the most powerful, so what they say and do affects everyone. As I said, I enjoyed this one much more than the other two books in this series, so I'm going to give it 4 out of 5 stars. It renewed my interest in the characters, and in the books in general. Ooh, you've just reminded me that I have this on my laptop still waiting to be read! I really loved book 1 and 2 so I'm expecting to love this too. I think it'll be awesome to see that side of Kate. This book is a great tie between The Goddess Tests and The Goddess Interrupted. I wish that it had been longer as it took me very little time to finish. I would recommend this book to anyone who wants more about Kate.